Santa swoops from the sky in his sleigh drawn by eight tiny reindeer. Behind him, he trails a sparkling Christmas greeting. EXCLUSIVE product. 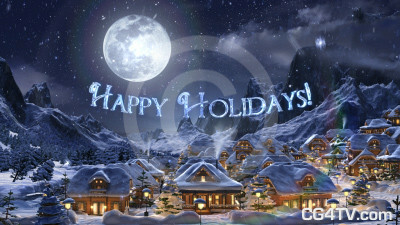 Happy Holidays 3D Clip is only available from CG4TV.com. We don't have resellers or representatives. This product that can not be purchased elsewhere. You creep down the stairs and throw open the sash. Deeply, you fill your lungs with the frosty air. You close your eyes and sigh. This is your favorite time of year. Your mind drifts back to the days when you were a child, when the Christmas season was a time of unmatched joy and mystery. Suddenly, a strange sound rouses you from your reverie. You open your eyes and look toward your sleeping, snow covered hamlet, nestled peacefully in its mountain cradle. The moon hangs overhead, making the snow-covered roofs glisten. What’s that? You hear the sound again, and then behold a sight that you hadn’t thought possible – not since you were a child. Santa swoops from the sky in his sleigh drawn by eight reindeer. Behind him, he trails a sparkling Christmas greeting. The Holidays are coming! Think of the ways you can use our Christmas Happy Holidays animation. Bring forth the spirit of the season. Evoke the joy of Christmas. Our charming animation inspires the best memories in all of us in a premium quality, high definition animation. 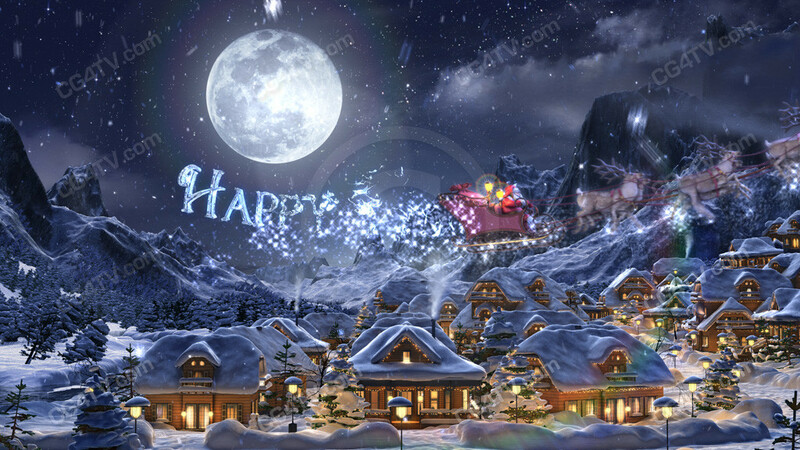 Let your imagination be your guide in how you use this high definition Christmas Happy Holidays animation. And remember, all our animations are available in a variety of sizes and resolutions to meet your needs. Why spend money and time developing a custom animation? Royalty free use of this low cost Christmas Happy Holidays animation will be easy on your wallet and on your busy schedule. It’s the most delightful Christmas Happy Holidays animation you’ll find. Why wait? Get it now. It’s easy. Just a few simple clicks of your mouse and you’re ready to go. Download is immediate. All major credit cards are accepted.